From the 1stof October the chain of responsibility legislation has been broadened in scope in order to more effectively address unsafe practices related to Heavy Vehicles on Australian Roads. The focus being to reduce pressure on drivers, and to expand the sphere of accountability to include the off-road parties which fall within the supply chain of the goods being carried. 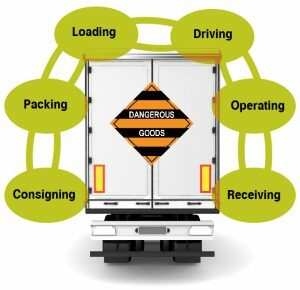 This has been done to encouraging supply chain participants to adopt practices which support safer driving through the identification and removal of unsafebusiness practices which lead to driver pressure and subsequent risk. Parties in supply chain who utilise heavy vehicle transport to move their goods have a duty to ensure the safety of their transport activities. 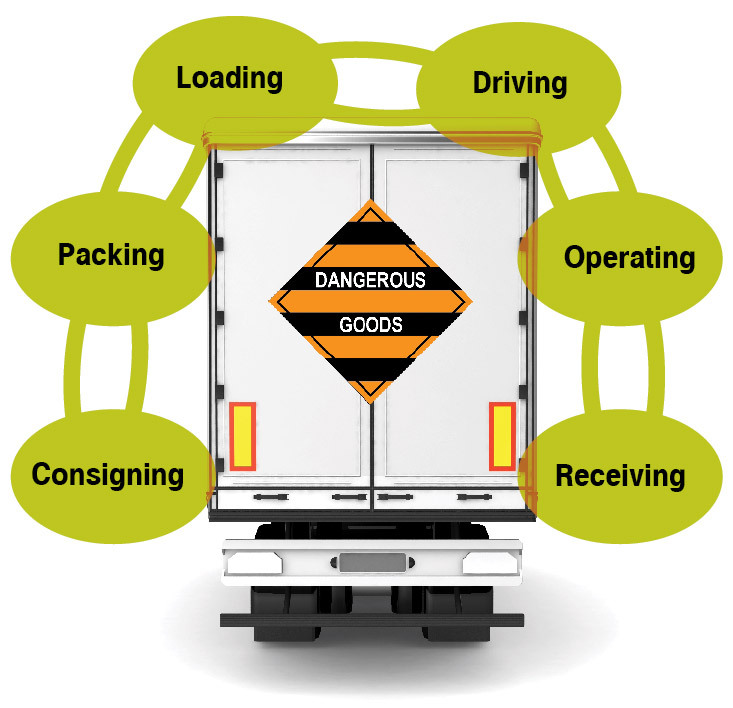 loading mangers whose practices for loading and unloading impact on driver available driving time. Other situations which may put the driver under pressure to speed or exceed their fatigue requirements for work and rest. resource appropriately to reduce or remove risk, including the implementation of safety management systems. review contracts to ensure that they do not require drivers, or the supply chain team to break the law in order to fulfil requirements. Where an incident becomes an issue for the court of law to resolve, each party in the chain must demonstrate that they took all reasonable steps to prevent the contravention of the legislation or show that they have done everything that is reasonably practicably and could not be expected to have prevented the contravention from occurring. Safety management system are recommended for implementation in order to eliminate or minimise potential risk, Implementation demonstrates that an organisation doing all that is practicable to ensure safety as a party in the supply chain. communicating to staff about safety and development of policy documents. Hazard and Risk identification, Documentation and Reporting. Process of investigation into hazards or risks, with a view of continuous improvement. Regular communication and training on areas such as safe processes, mass management, impact of over speed and fatigue. INTERDEV’s xmotion workforce platform can form the basis for a transport organisations Chain or Responsibility implementation assisting business owners, operational teams and drivers with access to the information they need to run an efficient and safe business. Safe & Efficient Scheduling of jobs, trips, journeys. Drivers benefit from using one application to manage their entire day from start of shift to completion. Job Information include safe workflow management. * Note, we do not try to replace existing finance or payroll systems, our platform is designed to integrate into these systems together to bring a single view of the data you need to run your business. 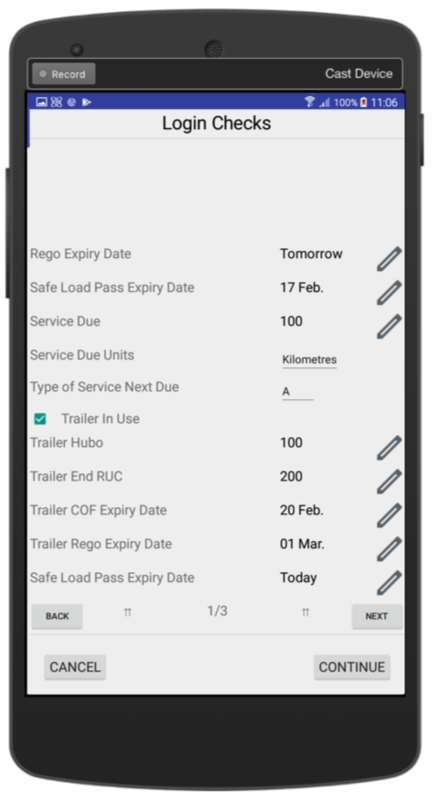 With the upgrade to the default mapping client on the drivers tablet in the field, INTERDEV can now specify routes for drivers to follow, which address issues relating to Mass, Dimension or Dangerous Goods requirements. With the utilisation of Vehicle Types and setting of dimension and mass restrictions within workforce server for a vehicle, workers in the field can now benefit from accessing the safest routes, when the utilise the inbuilt navigation utilised by the workforce client. This is done through the association of a vehicle ID with a vehicle type. When a driver starts their shift, they login with their details and the vehicle identifier. This then passes the vehicle route requirements through to our mapping provider to ensure that the latest, safest and most efficient route is provided to the driver to follow when the request a route between two locations in order to complete a job. INTERDEV’s workforce platform is design to provide business owners, and operations teams real time updates on job progress. 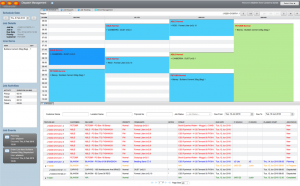 Extending the real time view of job progress provided by the scheduler is the Management Dashboard interface which enables business to build a single pane view of business performance. Due to the flexible design of the workforce platform, any data that passes through the platform can be reported on, or incorporated into a dashboard widget. If we can see a revenue generated figure per job, we can report a real time revenue view for the day, week, month, year. Data can be represented using, pie charts, bar charts, gauges and tables. Proof of Completion MMS messages now availible – Save on incoming customer service calls. MMS – Picture Messages are now available in INTERDEV’s workforce platforms. Like SMS, the MMS messages can be s ent based on events generated within the drivers job process. Most common implementation is the addition of MMS messages to the delivery completion. Drivers are prompted to take a photo for proof of completion, this image is stored in workforce, can be emailed, or sent to the listed mobile number on the job to provide an immediate job completion notification. This message can be configured to include the signature of a receiver where a signature is also captured. MMS can also be configured to alert customers to Unable to Deliver situations, where physical access may have created an issue with job completion. Contact the INTERDEV team to find out how we can assist with improved delivery communications with your clients. email solutions@interdev.com.au if you would like to learn more. workforce client nows supports incident or hazard reporting as part of the available features within the workforce client for Android. Drivers don’t need to leave their job application to capture details regarding a hazard identified, or incident which has occurred during their work day. Hazards can be recorded as part of the job, with classifications for the hazard type being configurable through the workforce platform. 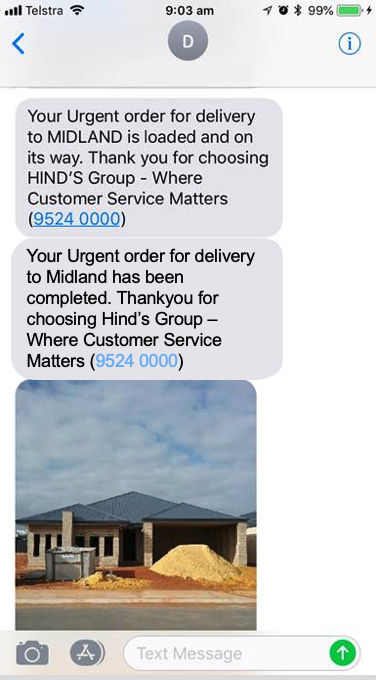 Hazards can be configured to trigger email alerts or SMS or MMS events, depending on your business requirements. 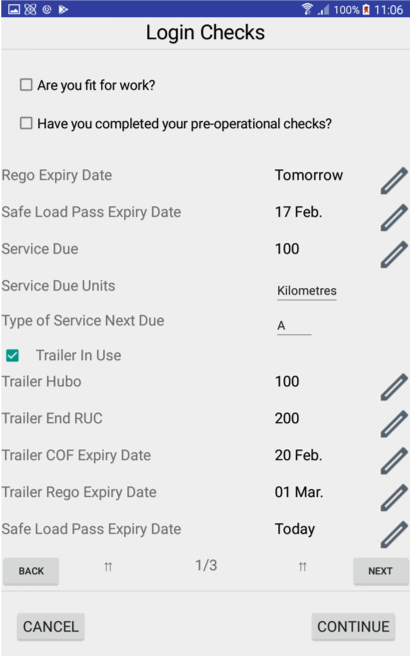 Operations side, a Hazard review module enables operations teams to review hazards raised from the field and notify the relevant parties to ensure they are rectified. 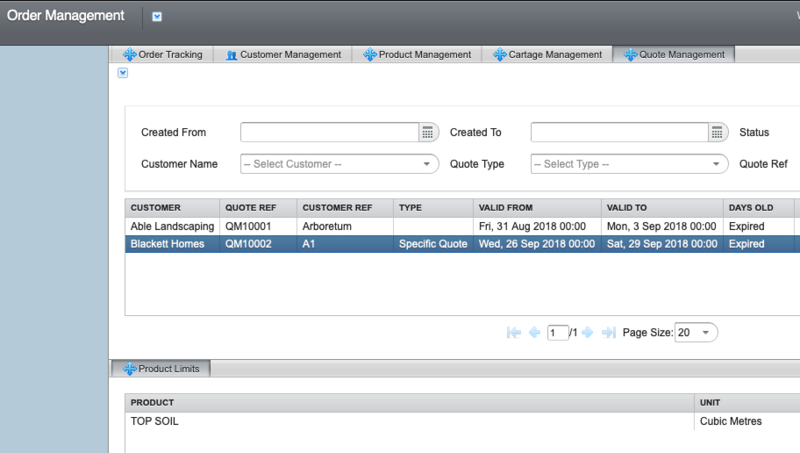 Likewise the Incident reporting interface can be customised to enable a user selectable list of incidents to be reported. The devices camera can be used to capture photos of the incident or hazard to be escalated. Review workflows can be created within the workforce platform to enable operational review, and closure. 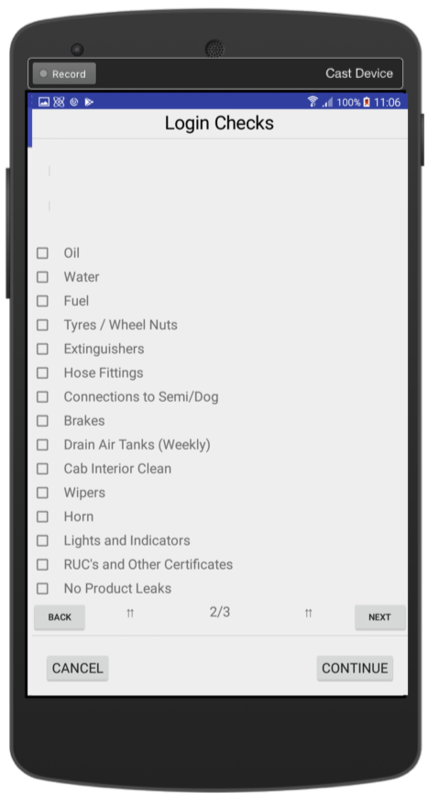 Customisable Forms – fitness for duty, vehicle safety checks, end of day reporting. Interdev’s workforce client has been updated to include customisable forms, this enables the operations teams to change questions in the forms, and have them dispatch to field workers for completion on their next login event. Common deployments for forms include replacing rigid, pre-driver fitness for duty check lists and vehicle safety and compliance checks. Often with existing solutions for vehicle safety checks, you have a one form fits all vehicles, which is not ideal for large fleets. With workforce, a form can be triggered based on the vehicle type associated with the vehicle identifier used at login by the driver. This enables vehicle specific safety and compliance checklists to be dispatched that match the vehicles specific requirements. Form can also be embedded with the workflow of jobs, to ensure that within a job key safety activities are undertaken either at loading, delivery stages, or end of day. The screen shot below shows an example of a dynamic form, data that can be entered is defined as the form is created within workforce. Data types can be check lists, text, number entry, drop down boxes, distances, times and dates. workforce flexibility – products, cartage rates & quotes. workforce’s flexibility and modularity enables business to adopt some or all of it capability. With the use of the integration hub, we can receive order or job data from your existing platforms, and make this available for scheduling and dispatch to workers in the field for completion. region based – suburb, town or configurable regions. Utilising the workforce quoting capability simplifies the conversion of quotes into orders, and the subsequent orders into jobs. 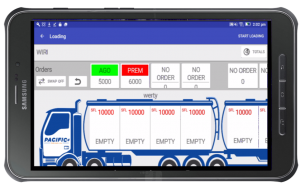 workforce timesheets module has been designed to add to remove the headache of paper based timesheet from your business, and simplify the logging of events within a drivers day such as breaks, delays, truck washing and expenses. With workforce timesheets, we are not trying to replace your existing payroll platform, what we are doing is reducing the manual data entry that occurs in the field and by your operations teams. Timesheet data is presented within the workforce platform for review and approval by managers. With the triggering of approval, the data is pushed to your existing payroll system using SIgH, our integration platform which can package the data up to go through a pre-determined API, or export as a CSV file for import into the payroll platform. The screen shot below is the job summary screen, it enables a drive to see at any time, how their time has been spent for the day. On completion of each day the driver sign’s off the time sheet, acknowledging the information submitted is true and correct. INTERDEV’s workforce 1.0 latest scheduling interface enables business to take control of the their delivery scheduling to increase the efficiency of fleet use. Available Vehicles, Drivers and Shift Hours. New jobs to be scheduled. Job details, which are shown in the left panel. Log of all activities recorded against the job since creation. As jobs progress schedulers can see the jobs status change by colour flagging jobs in progress, jobs that are at risk of running behind and jobs that are complete. 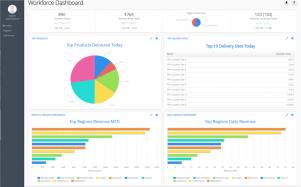 If your challenge is schedulers allocating too many jobs to your delivery teams, because they do not understand the time it takes to travel between your depot and delivery locations, then workforce’s schedule view will assist your business to improve customer satisfaction and ensure efficient use of your fleet. With the new Chain of Responsibility legislation that comes in to place in October 2018, responsibility for un-achievable schedules will now implicate the behaviour of the schedulers and the rest of the business. INTERDEV’s workforce platforms enables greater customer communication through the use of event triggered SMS notifications to customers. Great communication with customers ensure high levels of first time delivery, greater delivery efficiency and great customer satisfaction. In the implementation example, the first message was triggered when the jobs are allocated to a day for delivery. The text of the message within the workforce administration console. Message is sent via the workforce Messaging Hub. The final notification message is triggered then the driver completes the preceding job, the time can be pre-configured or calculated based on estimated travel time from the current location to the next location. INTERDEV’s workforce platform is designed to integrate with your existing business applications enabling seamless movement of delivery, driver and vehicle information between operations teams and the field. Being a modular platform, adopters can utilise some of all of the available modules. 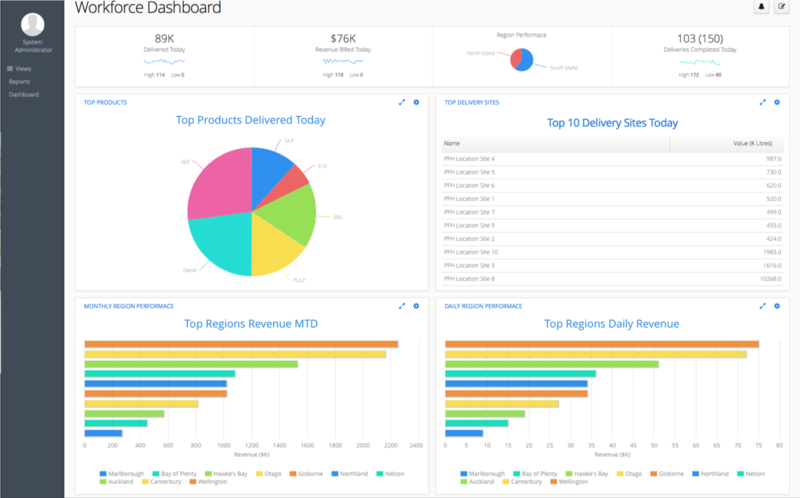 Often we find that ERP platforms often do an excellent job of manging the product or service delivery workflow while the activity is inside the business is efficient, getting the delivery information to the workers can be cumbersome, and often exclude the ability to mange the actual driver and vehicle resources. Workforce has been designed to be modular and customisable, enabling business who see the delivery process as a key part of their competitive advantage. Our driver application, is underpinned by our workflow engine which provides us with the ability to manage a drivers workflow in the way that you require from the moment he commences his shift through to completion. This information is available for review within the Workforce platform where it can be reviewed before pushing to your existing ERP, Accounting or Payroll systems. INTERDEV’s workforce 1.0 Scheduling interface enables business to take control of the their delivery scheduling to increase the efficiency of fleet use. 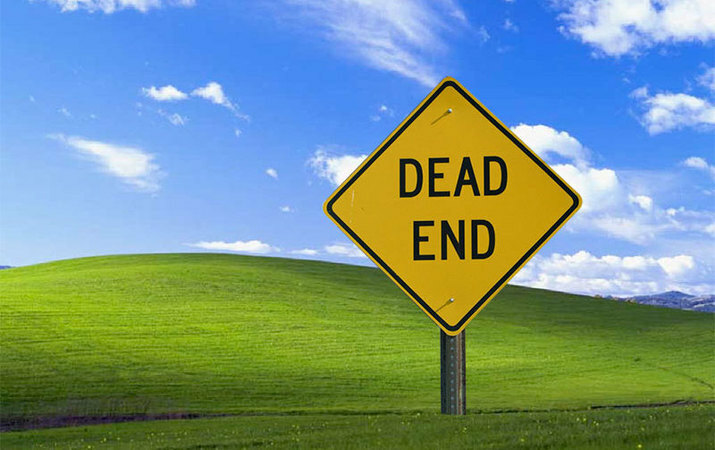 Windows Embedded 6.5 Hand Held will be end of life 14th January 2020. 2020 sounds a long way off, however if you consider the age of your devices in the field, you probably need to be building out a plan today for the day when they will fail, and you will not be able to repair them or replace them with a device which supports Windows Mobile. INTERDEV has solutions for ANDROID and IOS. Both operating systems offer a familiar smartphone experience, making the transition easier as it is familiar to almost any user. Mobile device manufactures who have come from the rugged handheld space such as Honeywell and Zebra, have chosen Android, however Honeywell, also supports IOS by offering a range of solutions for enabling rugged barcode scanning capabilities to iPhones and iPads. Samsung the leader in consumer Android products also has a product which is a cost effective rugged tablet. INTERDEV is a Honeywell, Zebra and Samsung ISV partner, we can assist you with selecting the right device for your business. workforce 2.0 Android Driver App. Tracking of Driver and Vehicle through secure Login and vehicle and trailer recording. 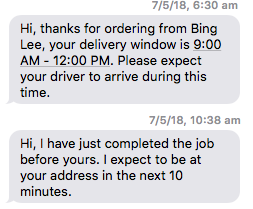 Time Stamping of Delivery events. workforce 2.0 Android can be customised for those organisations with complex workflows that go beyond your basic pickup or delivery process. INTERDEV’s development team have completed integration with Xero accounting software. Further expanding INTERDEV’s capability to support small to mid size business who have a transport or services component as part of their day to day operations. INTERDEV’s System Integration Hub (SIgH) provides the link between the Xero API’s and xmotion workforce billing review screen, where operations and finance people can review job costs and update before sending off to be invoiced. Depending on your business requirements, invoices can be generated and sent either from the workforce platform to the end customer or via Xero. Have you stopped to consider what your field workers do when they have idle time? Once they have checked their social media, on their personal device, they often turn their attention to the new ruggedised tablet which runs your delivery management application. It runs on Android, their smartphone runs on Android. They know how this should work. The first thing they will probably do is try to fire up a web browser to surf the net on your data. Then try the play store, why watch Netflix on their phone, when they could load it on your tablet, use your data, and watch it on an 8″ screen instead of a 4-5″. 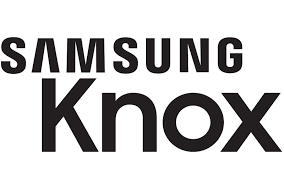 Samsung Knox allows partners to lock down the tablets deployed in the field to ensure that users can only access the applications and information they need to complete their job efficiently. The Knox platform consists of overlapping defense and security mechanisms that protect against intrusion, malware, and more malicious threats which can often be inadvertently introduced by workers using insecure devices. Add your logo to the devices boot screen. Kiosk Mode – Boot the device into an application launcher which only allows your applications. To find out more about how Samsung Knox can be deployed as part of your workforce management solution, contact the INTERDEV Team. xmotion™ Fuels is now available for use on android 7″ & 10″ tablets. With the move to android tablets, xmotion™ Fuels for Android brings greater ease of use to drivers and even more functionality for the business. easier data entry, bigger screen, bigger keyboard. drag and drop load and unload of tanks at the depot, on the truck or in the field. expanded pre-trip safty check capabilities. ability to dial directly from the tablet. greater delivery site information and safety notes. ability to store compliance documentation and certificates. ability to take photo’s as proof of completion. 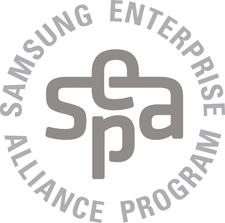 The INTERDEV team have been recognised as a SAMSUNG Enterprise Alliance Partner for their commitment to development of Android based delivery management solutions. Capturing Start of Shift Events for use by the time-sheet module. INTERDEV’s philosophy for Android development revolves around the idea of having a single application for management of a drivers day to avoid duplication of data entry across multiple platforms or even paper based forms. Ultimately improving the accuracy of information delivered to and received from field base workers. This is achieved through the deployment of INTERDEV’s cloud platform which provides an integration point to a businesses existing line of business platforms such as ERP, WMS, Payroll and Accounting. INTERDEV’s development team have completed integration with MYOB Accounts Right accounting software. 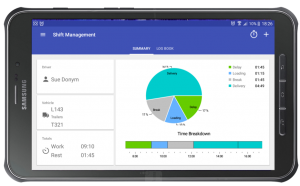 As a business owner or operations manager, simplifying the deployment and management of applications on company owned smartphones and tablets, becomes an operational headache as your fleet grows. Users of the devices will inevitably download personal information or their own favourite applications, potentially impacting the reliability of the device or the security of your business data. The adoption of mobile device management (MDM) solution brings significant efficiency to the process of deploying applications and managing the devices once they are in the field. Ability to limit user access to only approved applications. Control the ability for device users to load their own applications or change the device configuration. Deliver over-the-air updates to business sanctioned applications, such as INTERDEV’s workforce client application as new features are rolled out. Ensure that all devices have the same configuration, for settings such as mobile data, WIFI or bluetooth and location sharing. Expanded control to manage email, calendaring, and contacts applications. Compliance and security capability to help you safeguard devices and data. Device remote control to assist with user issues while in the field. Monitoring and reporting to track, diagnose and resolve device issues. Up to date Software and Hardware inventory. Available for IOS™ , Android™, smartphone and tablets. Interdev offer the MDM platform as a service, in conjunction with our xmotion™ workforce platform. The Interdev team will work with you to build a profile for your devices, identifying business specific applications, websites and services, that should be enabled on users devices, and identifying those that shouldn’t. Once the profile is complete, your devices will be enrolled into the MDM platform ready for management. Deploying MDM ensure that devices that you provide to your employees are used for business, and create the business efficiencies you expect from your investment. You’ve probably tried scanning a barcode or QR code (3D barcode) with the camera on your smartphone, its a slow process. Open the barcode reader application. Line the camera up with the barcode, let it focus. . Press the button. The barcode information is then displayed. How do you scan barcodes quickly? 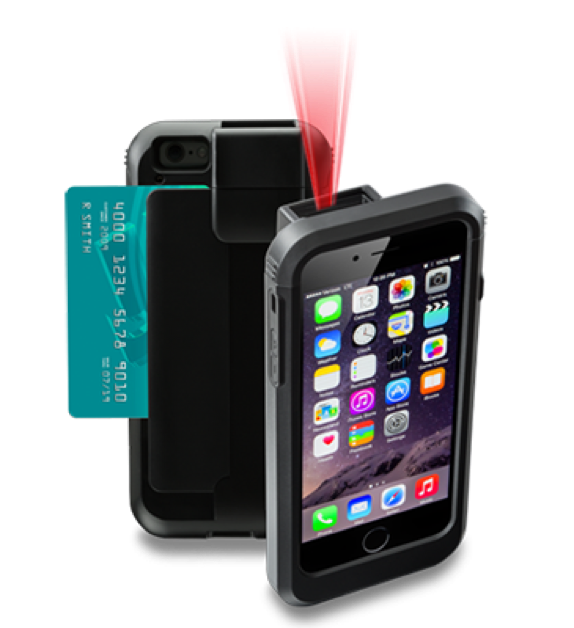 With a purpose built sled, which attaches to your iPhone or iPad, to add a dedicated warehouse quality barcode scanning capability, without losing the ease of use and power of your IOS™ device. These dedicated sled’s come with their own inbuilt battery in order to power the reader and provide top up power to your iPhone™ or iPad™. In the case of iPhone™ the sled will make the iPhone™ more rugged, able to withstand dust, and drops and splashes, without making it too bulky for your field team to keep in their pocket. Payment processing is also available on some models, through, swipe, tap and go or chip reader technology. Barcode scanning and payment process are modules which can be added to your xmotion™ workforce platform. In vehicle GPS tracking vs mobile workforce management. 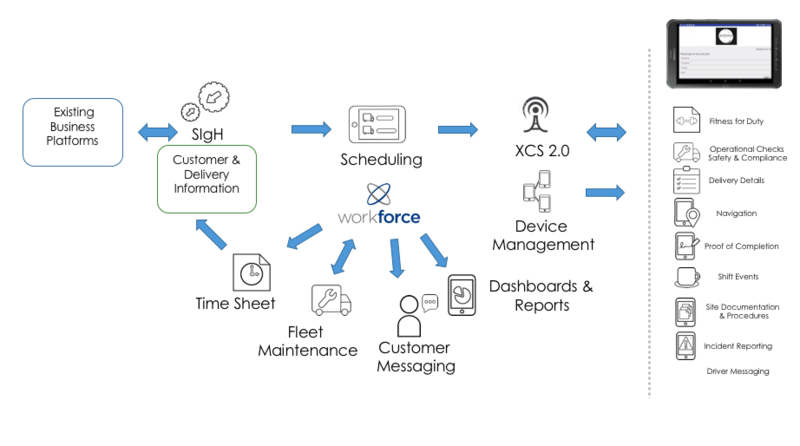 The following scenario compares the experience of a driver and an operations team, one based on an in vehicle GPS tracking solution with a paper based workflow and the other utilising the xmotion™ workforce application. The scenario highlights the additional visibility a mobile workforce solutions provides and the removal of the need to have administrations teams process the paperwork returned by workers at the end of day or on completion of jobs. • fills in time sheet with start time. • may complete vehicle check. • Vehicle located on map. • Device tracks for the day commence. • logs on to commence shift. • completes Fitness for Duty statement. • Driver located on map. • Safety and Compliance requirements met. • Printed list of Jobs of for the day. • Clipboard of delivery paperwork. • See vehicle movement on a map. • Phone driver to change priority. • Jobs displayed in the workforce application. • Driver accepts first job. • See job progress to “InProgress”. • See driver progress on the map. • Can re-order jobs in real time, if priorities change. • Manually enters first job into the GPS to commence navigation. • Selects the address to commence turn by turn navigation. • Select customer phone number to dial directly from the application. • Drivers call logged against job activity. • Identifies the correct paperwork. • Customers signs paperwork and keeps a copy. • Driver keeps a copy for processing by administration at the end of day. • Vehicle arrives and is stationary on map. • Unaware of status of delivery. • Wait until end of day to finalise processing of job paperwork. • Details of job are displayed. • Customer signs on the device screen. • Can take a photograph as proof of job completion. • If unable to complete job, can select option in device and reason. • Arrival time logged against Job. 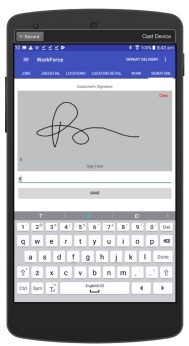 • Customer Signature received, Job moves to Complete in Operators screen. • Notified in real time of unable to complete. • Customer completion notification can use set via email or SMS. • Driver completes time sheet and submits at the end of day processing. • Vehicle stops moving on the map. • Break details processed when paper returned at end of day. • Driver enters break details. • See in real-time when a driver is on a break. • Confirm Safety and Compliance requirements being met. • Driver hands in delivery paperwork and time sheet for processing by administration. • Commence processing accumulated paperwork. • Driver Log’s off from workforce application. • Delivery and timesheet information is updated in real-time throughout the day. • Business owner can see status of business in real-time. Works on IOS™ and Android™, smartphones, tablets and ruggedised PDA’s. Can be run on company owned or driver owned devices. Its less expensive and more reliable than hiring someone to process paperwork. xmotion™ workforce | Transport is now available for use on android smartphones, tablets and ruggedised PDA’s. 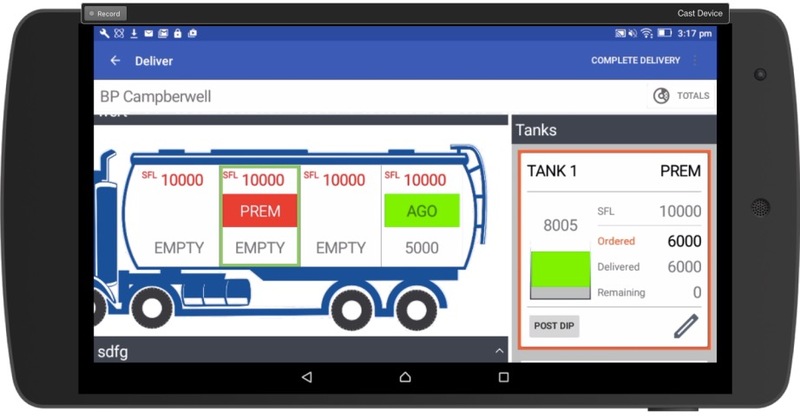 With the move to android xmotion™ workforce | Transport Fuels brings greater ease of use to drivers and even more functionality for the business. easier data entry, easier to read screens. ability to dial directly from the device to the customer. Barcode scanning for end to end tracking. User-Pays Charging for Trucks needed, Govt MP. Federal MP believes directly charging trucks based on vehicle type and distance must happen. A future charging system for heavy vehicles should be built around distance and vehicle type, according to a Federal Government backbencher. 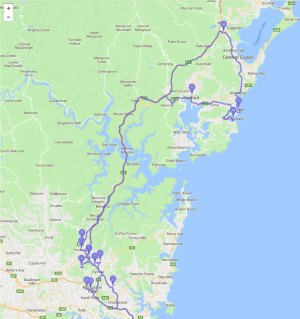 THE nation’s 548,000 trucks could be required to install GPS devices so they could be charged for the distance they travelled and the roads they used under a controversial proposal being considered by a high-powered advisory group. The Heavy Vehicle Charging and Investment Reform group – whose work has been singled out by Tony Abbott and state leaders as a priority for the infrastructure agenda – has issued a stinging critique of the system for funding roads used to move freight. The critique claims there could be almost $22 billion in net economic benefits from radical changes. The group warns that within seven years, and possibly sooner, the limits on revenues raised by heavy vehicle road-user charges paid through fuel excise will be reached. When this happens, the only source for extra roads funding would be “inefficient, inequitable and lumpy” registration fees that truck owners pay to the states. The warnings are significant because last month’s Council of Australian Governments meeting said it had commissioned urgent work on heavy vehicle charging and investment reform, with the group set to give further advice on its proposals to the next COAG meeting. Rail companies have been pushing for trials of “mass-distance-location” pricing that would charge trucks based on their weight, distance travelled and the roads they use. But the peak body for trucking operators has demanded a halt on work to the HVCI’s proposal for mass-distance-location charges, saying it has “grossly underestimated the cost, administrative burden and practicality of rolling out and maintaining this equipment”. Border Express driver Chris Bird said that efficiency could be improved by addressing congestion. “I spend half my life parked on the M4 (motorway in Sydney),” Mr Bird said. In a submission to the Productivity Commission inquiry into infrastructure, the HVCI says existing charging arrangements have a number of deficiencies, including that heavy vehicle charges are “disconnected” from roads spending and mostly flow into federal and state government funds. Because road providers are largely funded through annual government budgets, they have no funding certainty. “This can mean that road works are undertaken at a time that is inappropriate (eg, before heavy rainfall months) or are concentrated into a short period of time putting greater pressure on road construction and inflating costs,” the submission says. 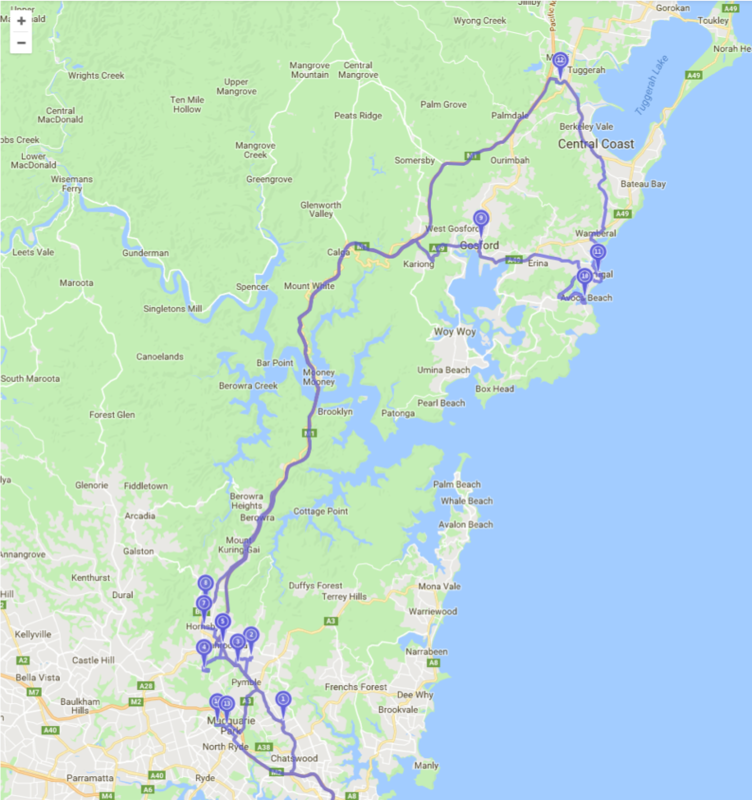 On top of this, there are bottlenecks on local roads because councils rely on council rates and government grants to provide roads that are crucial for distributing freight. That means trucks “either have to decouple trailers and run multiple trips or operators use smaller less productive vehicles that will be able to travel over the entire route”. The HVCI group says the specifics of the reform are still to be agreed among governments and that a number of different options for truck charges are being considered, including a national fuel-based charge and mass-distance-location charging. While mandatory in-vehicle GPS technology was an option, HVCI project director Meena Naidu said that the group was looking at various models. While countries in Europe have tended to make GPS technology compulsory from the start, others including New Zealand and the US state of Oregon had made it optional. “Ideally we want to leverage as much as possible off the GPS technology that already exists in a lot of the heavy vehicle fleet,” Ms Naidu said. But Mr St Clair said the plan would deliver positive economic benefits only if accompanied by “dramatic” changes to the way governments plan, fund and build road freight infrastructure. “These changes would greatly reduce the discretion of governments to announce and implement their infrastructure policies. It’s hard to see governments agreeing to this. The likely result is that the industry would be saddled with a complex new charging system without the expected supply side benefits,” he said. Another option being considered is a reformed fuel charge with lower registration fees, but a higher road user charge. Under the existing road user charge, trucking operators receive a fuel tax credit for the difference between the charge (of 26.18c a litre) and the fuel excise rate of 38.14c/L. But because of the rate the road user charge has been increasing; it is expected to reach the fuel excise ceiling in the next five to seven years. The Queensland Police Service has boosted the number of devices involved in its mobile workforce pilot and plans to put the feelers out for a potential managed service arrangement later this week. The state police force revealed in July it was trialling a mobile data strategy to allow its field officers to access several databases – previously only accessible at base or via a two-way radio – while on the road. The pilot, initially scheduled to run for up to six months, involved 50 Apple devices and the new, internally-built QLiTE mobile application, which provides access to three police databases. QPS late yesterday revealed the pilot has now grown to encompass almost 400 iOS devices – iPad minis, iPhone 5s and iPhone 4Ss – as the government prepares to study the force’s business case for a wider rollout.